Winmate extends its medical product family with a new 15.6-inch Medical Display W15L100-PTA3-ME for diagnosis and clinical review. Featuring a 1920 x 1080 Full HD panel with high luminance and contrast, the display has accurate image reproduction for important medical imaging needs. For a more user intuitive experience, the display also includes a projected capacitive multi-touch screen. The compact lightweight housing allows for easy handling, and the ergonomic design gives the display the flexibility to fit in environments such as surgical centers, clinics, and doctors’ offices. This medical grade display will help to improve patient care while meeting the stringent manufacturing regulations set by the medical industry. Certified to IEC 60601-1 and complies with international medical and patient safety standards. Flat surface simplifies disinfection and cleaning liquids from the panel. P-Cap multi-touch for easy user controls. 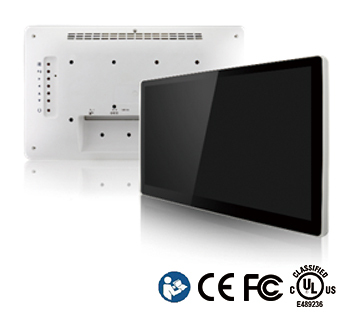 The display's slim, compact and lightweight design facilitates user adjustment of display position. All signal connectors face downwards, allowing easy and organized cable connection to other equipment. * For more details on compliance and certification, please contact Winmate.